After our third day in Taos we drove to Gallup with a dinner stop in Albuquerque. We spent most of Thursday at Canyon de Chelly and then drove to Flagstaff. So Friday at Arizona Snowbowl was the final day of our Southwest road trip. Liz got a pleasant surprise! Neither one of us has ever gotten a free birthday lift ticket before. I've only skied my birthday 4 times, but this was my 13th March 29th, though only third with Liz. With the preceding warm week it was no surprise that Arizona Snowbowl had 100% spring conditions. Although there were clear blue skies, there was a breeze not far above the ski area and it felt cooler than the advertised 42F high. Snowbowl has primary west exposure, so it can take some time for snow to soften. My other day here was March 31, 2001. That was a Saturday but it was much busier this time. Fortunately the ski area has made significant improvements since then, notably a high speed six pack chair to relieve the pressure on the Agassiz triple. The old triple goes about 500 feet higher than the Grand Canyon Express, but with the day's conditions we only went to the top twice. I saw no snow guns next to any of the runs. I'm sure they were not necessary after Snowbowl got 150 inches natural snow this February. We got on the mountain at 10AM and Liz said not even eastern ski areas would call what we first skied from the Grand Canyon Express "packed powder." The main runs were still on the firm side at noon so we took three more laps on Humphrey's, which was now in good corn mode. Locals said it can take to 1PM to soften the Agassiz runs, and that was about right today. This is the way it works sometimes in spring at Mt. Baldy, when you bide your time on sunny chair 4 in the morning while waiting for Thunder to soften. We did take a couple of rides to the top of Agassiz for the views. Humphrey's Peak at 12,633 feet is the highest point in Arizona. The green strip near the horizon at left is the forest on the South Rim of the Grand Canyon. The lighter colors beyond are on the North Rim, 1,500 feet higher than the South Rim. Humphrey's Peak later had a wind plume at the top. The building at right is labelled, "Highest Toilet in Arizona." From the Spur Catwalk we get a view of the Upper Bowl. There's diagonal bootpack to get up there, probably 10 minutes or so, worthwhile on a powder day but not today. Logjam, the run down a natural gully, has been drastically graded and widened since 2001. It's lower half had softened by 1PM. Stump Patch, Meadows and Northstar were also in corn mode by 1PM. But the most pristine corn was on Southern Belle, skier's left of this Sunset terrain park. With minimal traffic we skied here 4x between 1:00 and 3:30 and it was smooth as butter every time. The busier runs had smooth corn on their skier's left edges, which people had avoided in the morning as they were then in the shade. The Phoenix and Agassiz groomers had more of a north tilt and did not go to corn until about 3PM. Volcano is probably Snowbowl's best steep groomer, firmish but smooth snow not as severely melt/frozen as the lower/more mellow groomers. Volcano's lower pitch turned to corn when it tilted west dropping into Logjam. The ungroomed mogul runs fall away north from the Agassiz Ridge to Logjam. They remained firm all day and we saw almost no one skiing them. I tested a somewhat sunny middle section of the Agassiz liftline, which was edgeable but probably 3/4 of the turns were crunchy. So I was not tempted by other ungroomed terrain that was either shaded or more north facing. The good news is that with the firm freeze and not too warm temps, when the main groomers finally went to corn, they stayed good the rest of the day and never got slushy. My day with Adam in 2001 was warmer. The corn window for the groomers was shorter but the ungroomed skiing softened late in the day. By skiing nearly all groomers I totaled 28,100 vertical. We got on the road at 4PM and got home at midnight. The Southwest road trip totaled 11 days of skiing at 7 different areas, one new for me and five for Liz. Liz has added 19 new areas this season and I have added 16, both personal records. Looks like a great spring day. I've never received a comp lift ticket on my birthday; however, at Quebec's La Réserve in 2012, I skied there on the day where they gave free tix to people named James and Colette. Not sure why I didn't mention it in the trip report. Given that it's a local's joint that had recently been revived from closure, I made a point of spending more than the equivalent at the base lodge. Sunrise and add another new area to one or both of your lists. Sunrise is a 2-hour detour south of I-40. We decided the similar detour north to Canyon de Chelly would be more worthwhile Thursday. Snowbowl is the "town area" for Flagstaff with a similar access road as Santa Fe and Taos. High-speed quad chairlift on Sunrise Peak. Triple chairlift on Apache Peak. Check out those length to vertical ratios. The high speed quad is about 5-1. Cyclone Peak is 7-1. The steepest chairs on the entire mountain are 4.5-1. Standard blue terrain in Colorado is about 4-1. Terrain that flat with warm spring conditions is not fun. See lower half of Snow Valley/Big Bear as other examples. jamesdeluxe wrote: it's a shame that you couldn't make it to Sunrise and add another new area to one or both of your lists. I still have standards when seeking out new areas. I can tell from that map that Stratton has much better fall line skiing than Sunrise. Since Liz had never skied Snowbowl, this was an easy call. Tony Crocker wrote: I still have standards when seeking out new areas. 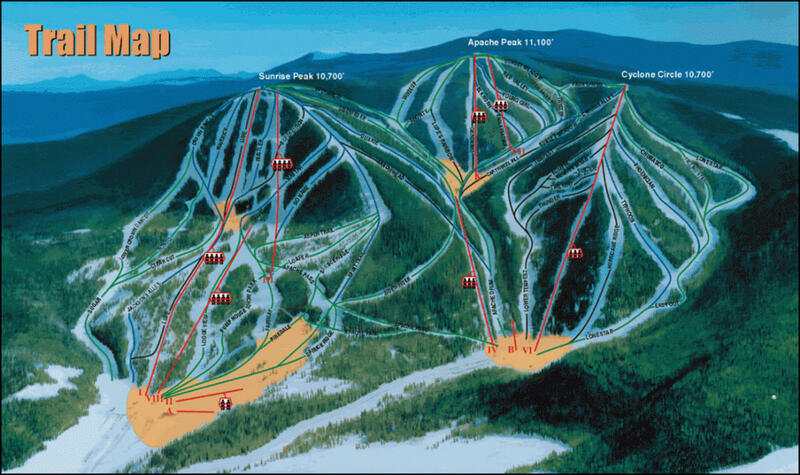 I can tell from that map that Stratton has much better fall line skiing than Sunrise. I hadn't done any research on Sunrise other than that it's owned/operated by an Apache tribe, similar to Ski Apache in New Mexico (allegedly the southernmost ski area in the U.S.). Makes sense that you didn't bother with Sunrise. Ski Apache is the second largest area in New Mexico by acreage, fairly intermediate and laid out about as well as AZ Snowbowl but not quite as well as Santa Fe. It is so far south that it's distinctly in the summer wet/winter dry climate even though its altitude range of 9,600 - 11,500 is adequate. Adam and I skied it in the very big 1992-93 snow year when Taos had a 130+inch base. Glad to finally see a TR out of Arizona though. It could be worse. It could be cloudy/windy and soften up NO terrain. Overall the day was similar to that at Purgatory the previous week. At Purgatory there was more wind and only the beginner areas turned to true corn. OTOH about 15% of the mountain retained winter snow. In Arizona spring had advanced further but the more widespread corn (though we had to wait half the day for it) made the two days somewhat of a wash. There is no lift left on Cyclone Circle. The Yan triple that is partially standing will never run again. Parts of the sheave assemblies are on the ground, chairs have fallen from the rope, and there are areas where the rope is on the ground. The lift has to be replaced. The runs on Cyclone Circle now require a hike, but are left unmaintained and with no avalanche mitigation work performed. I believe the lodge at the base of Cyclone Circle is abandoned. Eagle Feather while redundant on Apache Peak will never operate again. This Yan Triple has been stripped for parts. Rustler a Borvig Quad on Sunrise Peak is also redundant, serving only the upper half of the peak, and while I believe it is operational it does not operate. Sunrise Park would be interesting to visit because of the condition of the overall ski area. It's apparently a disaster! I was wondering about the contradictory trail maps I found online. I made the error of posting the one with the most lifts, which is obviously not current. Thanks for clarifying the situation. At least we made the right call where to ski on Liz' birthday.